Hello everyone, this is Astrid from Astrid's Artistic Efforts. I am super excited to host the third challenge and very much hope you will feel inspired to join us again. The theme I have chosen is "A Little bit French". 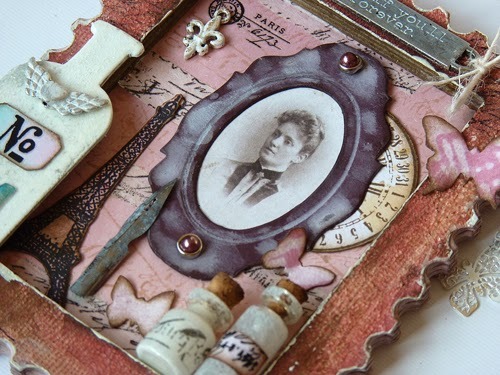 So whatever you decide to make, give your project that little bit of a French feel. 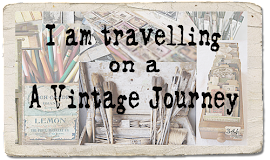 Tim has so many products that can be used to create a Springtime in Paris make, or if that does not take your fancy, why not something grungy or vintage but with a bit of a French flair? 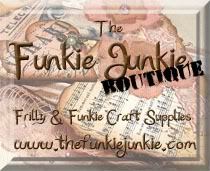 Think stamps, embossing folders, Distress products, dies, - the possibilities are endless. Whatever you do, enjoy the journey, but for this challenge, take it to France! 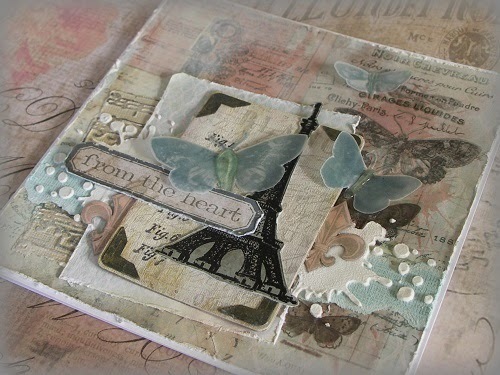 I had a fabulous time making this card with Astrid's French theme! Tim's inks, paints, tissue tape, dies and stamps together with lace, feathers and even an old fashioned fleur-de-lys envelope seal all wrapped into Tim's techniques - what fun! Bonjour! Are you ready for a trip to France? This week's challenge theme is "A Little Bit French". 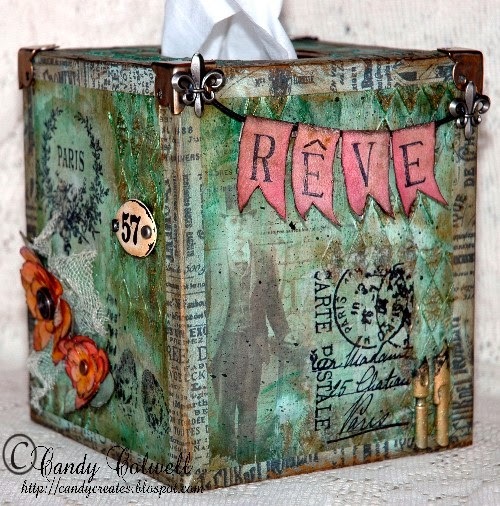 My very dimensional and vintage/shabby tissue box cover was so much fun to make...and useful! Every side employes different techniques, images, products and textures. Oooh La La! What a fun French theme this fortnight. 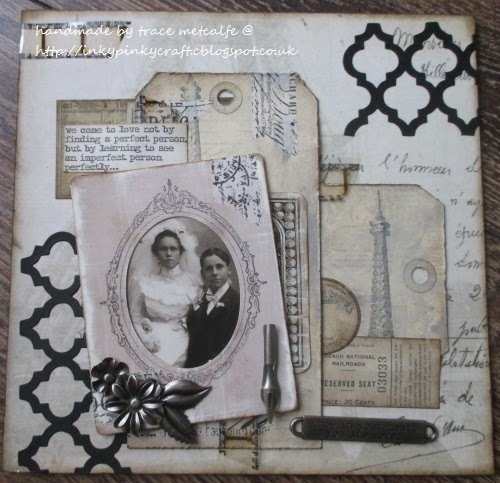 DT team mate Anne was kind enough to gift me some papers from the new Tim Holtz Wallflower collection and I just couldn't resist working with them for this card. It's definitely got that 'Springtime in Paris' feel, with a twist on the bleu/blanc/rouge colour scheme. 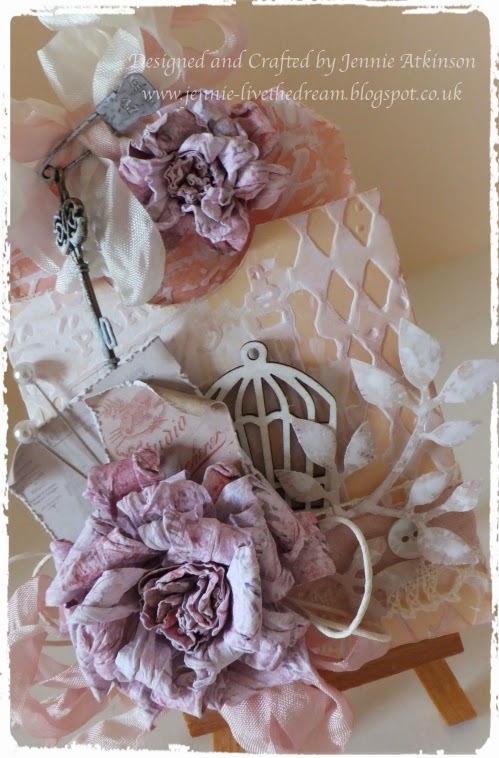 A Little Bit French makes me think of blowsy flowers, birdcages and the colour pink! I have no idea why! but here it all is brought together in a tag in a pocket. 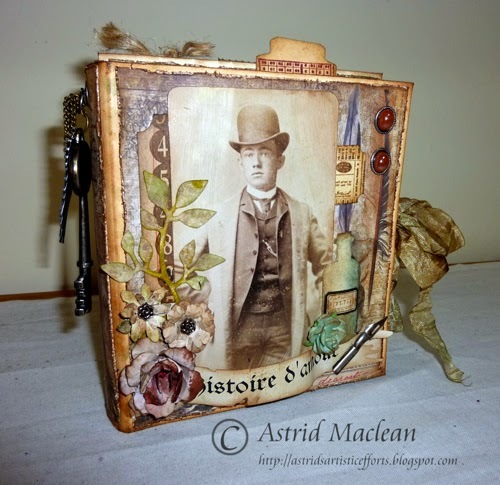 I had great fun using Tim's French embossing folders and gesso helped to tone down the Victorian Velvet Distress Ink. The flower was made using the Tattered Florals Die, moulding the paper while it was still wet. I went to Paris, once, in the Spring time and my lasting memory is that of the Eiffel Tower, so I used several dies and embossing folders, some Letterpress and inked my Tim Holtz Paris Memoir stamp set to create a little hanging. 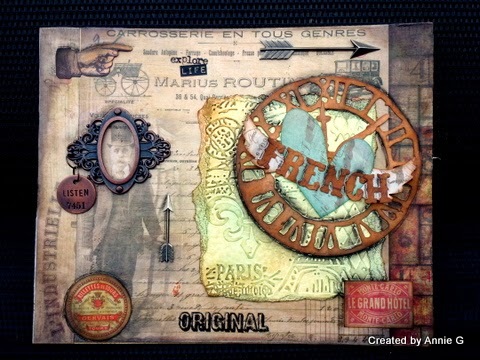 "A Little Bit French" inspired me to create a canvas hanging using various papers, stamps, dies, etc., from Mr. Holtz! Having never been to Paris, a girl can travel the world in her dreams and so I did. This lovely lady lives in Paris and spends her life writing letters and poetry and dreaming of the day when her fine beau comes back from war, she's hoping it could be any time soon. She loves her fine clothes, beautiful French perfume and buys lots of creams and lotions to help her keep looking good. C'est la vie. Well, I hope you like all the project from the creative guides and feel inspired to play along. We hugely look forward to see what you will make, and remember one lucky person chosen by the team will be our winner and will receive £10 token from Countryview Crafts. Before entering your project, please make sure you have read the Traveling Instructions, for if you don't you will not be eligible for the prize!! And if you want us to come and see your project and leave a comment, we will really appreciate it if you switch off word verification!! Au revoir and stay inky!! 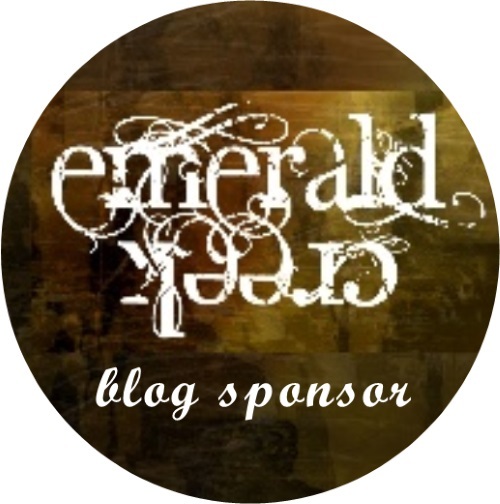 Fabulous theme. Stunning DT work. I have so many "French" goodies must decide what to do while I'm at work!! My goodness what an amazing DT.... a feast for the eyes! thank you all. I am unable to join in this time around but i will be wandering in to have a look at all the wonderful projects every now and then. Gorgeous projects from the DT. A great theme and fantastic inspiration. Wow! A wonderful challenge and the makes are fantastic!